New Brunswick, N.J. – Rutgers Cancer Institute of New Jersey is offering a clinical trial targeting an advanced form of colorectal cancer with a combination vaccine/immunotherapy drug treatment. The standard way of treating colorectal cancer that has spread to the liver or has recurred is with a combination of chemotherapy and removal of the cancer through surgery. This however, is not always effective as the majority of patients suffer a recurrence of their cancer following standard treatment. This emphasizes the need for new therapies that can prevent the cancer from coming back. Researchers at Rutgers Cancer Institute are exploring the combination of a new anti-cancer vaccine with an immunotherapy drug approved for use in other forms of cancer to determine if the combined treatment can prompt a patient’s natural defenses (the immune system) to attack their cancer and improve their survival. Investigators also will determine if the vaccine/immunotherapy combination works better than if just the immunotherapy drug was given with chemotherapy and surgery. 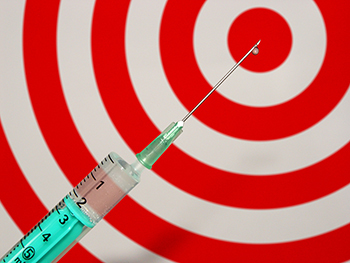 The investigational vaccine therapy is a newer version of a poxvirus-based cancer treatment formerly called PANVAC. PANVAC has been tested in more than 15 clinical trials and found to be safe. One of these trials was completed at Rutgers Cancer Institute in patients with pancreatic cancer. Given by injection, PANVAC helps stimulate the immune system against infection to recognize and destroy tumor cells that produce specific proteins. PANVAC has recently undergone some changes to improve it, and the newer version is now called CV301. Nivolumab is a different drug that is approved the U.S. Food and Drug Administration to treat other forms of cancer including melanoma, lung cancer and Hodgkin lymphoma, but not pancreatic cancer. It is considered investigational in this clinical trial. Nivolumab also stimulates the immune system. Darren R. Carpizo, MD, PhD, director of the Liver Cancer and Bile Duct Cancer Program at Rutgers Cancer Institute is the lead investigator on the clinical trial. “In approximately 80 percent of colorectal cancer patients whose disease has spread to the liver, the cancer comes back after surgery. With that, clinical trials aimed at testing new therapies to prevent recurrence are desperately needed. Immunotherapy drugs known as ‘checkpoint inhibitors’ have already made a significant impact in the treatment of several cancers, but only a minority of patients respond to them. Combining these drugs with other forms of immunotherapy such as vaccines (as designed in this trial) has the potential to increase the number of patients who benefit from them. CV301 is an exciting choice as the vaccine to partner with nivolumab, as its former version (PANVAC) has shown activity previously in this patient population,” notes Dr. Carpizo, who is also an associate professor of surgery at Rutgers Robert Wood Johnson Medical School. Patients aged 18 and older who are diagnosed with colorectal cancer that has spread to the liver and can be removed by surgery are eligible to take part in the clinical trial. Other criteria also must be met. Prior to being accepted into the clinical trial, participants are required to undergo a number of tests including bloodwork and a physical exam. Eligible participants will be assigned randomly (by chance) into two groups. One group will receive nivolumab and the standard chemotherapy given for colorectal cancer that has spread to the liver in addition to surgery. The chemotherapy will be given through a vein. The second group will receive chemotherapy treatment, surgery, nivolumab and the CV301 vaccine treatment. Those receiving the vaccine treatment will receive it through injection into a fatty part of the skin at multiple intervals prior to and after surgery. Once treatment is completed, participants will be followed by their health care team and undergo a physical exam, bloodwork and other testing on a regular basis over a five-year period. The phase II clinical trial will be conducted at Rutgers Cancer Institute of New Jersey and six other centers across the country. It is being supported in part by Bavarian Nordic A/S and Bristol-Myers Squibb and is being managed by Hoosier Cancer Research Network. For more information on how to take part in this trial, individuals should call Rutgers Cancer Institute’s Office of Human Research Services at 732-235-8675. CV301 is an immunotherapy candidate which is being developed by Bavarian Nordic A/S under a Cooperative Research and Development Agreement (CRADA) with the National Cancer Institute (NCI). CV301 targets two tumor-associated antigens, CEA and MUC1, which are over-expressed in multiple solid tumors, including lung, bladder and colorectal cancer. CV301 is an “off the shelf” vaccine which utilizes a prime/boost dosing schedule. CV301 incorporates a modified version of vaccinia (MVA-BN, a proprietary technology of Bavarian Nordic) as a priming dose, followed by multiple fowlpox boosts, and encodes the TRICOM costimulatory molecules.